Meet Elena of Avalor, the adventurous Crown Princess, and her loyal friend Skylar, a magical talking jaquin. 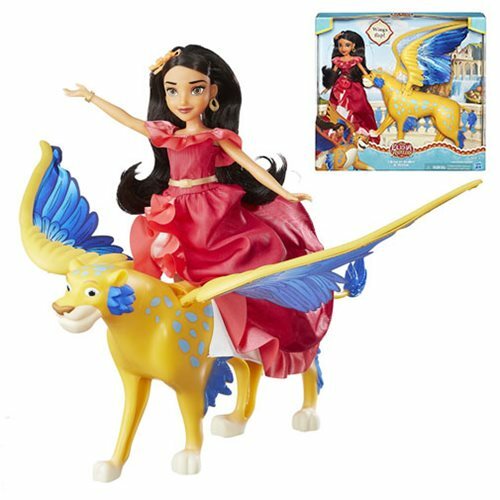 This 2-pack includes an Elena of Avalor fashion doll and a Skylar figure with large, vibrant wings that really flap when your little adventurer moves him up and down! The Elena of Avalor doll clips onto Skylar's back so girls can play out their favorite magical adventures from the Disney Channel TV series and imagine the two friends roaming the skies of Avalor defending the kingdom against all who threaten it! Ages 3 and up.